The film follows Judy Hopps, a young, courageous bunny who believes she can do anything. Inspired to make the world a better place, she determines at a young age that she will become the first bunny cop in Zootopia. However, police academy is a difficult hoop to jump through. 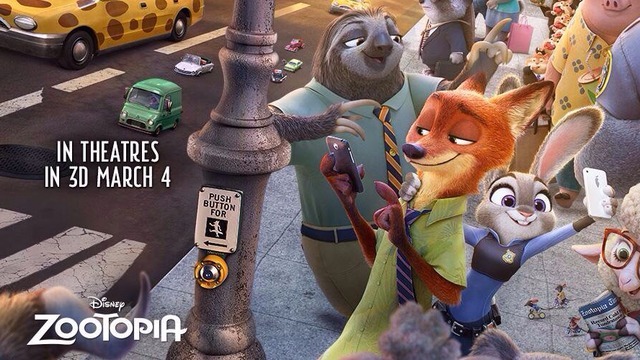 With lots of hard work, she earns her badge and is stationed by the mayor in the heart of Zootopia. On her first day, instead of jumping right into the investigations she is ready for, the police chief makes her a parking maid. Judy is not deterred by this and works to be the very best parking maid she can be. However, her love for other animals and her desire to make Zootopia better causes some detours along the way. I really saw myself in Judy. I always want to do better and help people as I go along. (I made "Acting" a portion for this film because there was only one actual song in this movie. I will say that "Try Everything" was a really great song that deserves a listen from you all.) I really enjoyed Ginnifer Goodwin as Judy. Goodwin has one of those cute voices that always needed to be in an animated picture. I was really glad that she was cast as Judy. I don't know anyone else who could have portrayed her better. Jason Bateman was excellent as Nick Wilde. Instead of becoming another Flynn Ryder or Kristoff, he brought his own thing to the character. I really enjoyed it. Some other characters whose voices I enjoyed were Mr. Big (Maurice LaMarche), assistant mayor Bellwether (Jenny Slate), and Chief Bogo (Idris Elba). Zootopia was so much better than I thought it would be! It was more of a detective movie than I was expecting. I really enjoyed watching the investigation play out. This movie will keep you on the edge of your seat. In the words of Larry the Cucumber: "I laughed, I cried, it moved me, Bob." It is still in theaters at the moment, so be sure to go experience it for yourself!